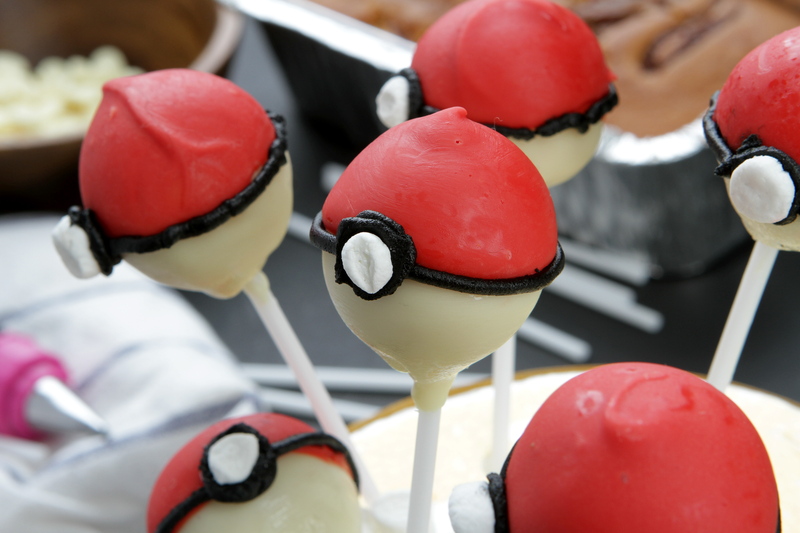 THESE Pokeball cake pops make great centrepieces at a candy station, or door gifts with a plastic wrap and a cute ribbon tie. If you’re looking to use up some excess cake while impressing Pokemon Go fans, this recipe is just the one for you. In a medium-sized bowl, use your hands to break up the cake into small crumbles. Add cream cheese frosting and mix thoroughly. Use your hands to have a better feel of the texture. The cake should hold its shape when pressed together. If it's still too crumbly, add more frosting a little at a time. Scoop some of the cake mixture and use your hands to press and shape the cake into small bite-sized balls. Tip: Use an ice-cream scoop to portion the mixture to create a uniformed size. Place these cake balls on a plate and refrigerate them for 30 minutes, or until firm. Melt white chocolate in a bowl, either using the double boiling method or using a microwave. If using a microwave, heat it up 20 seconds at a time and make sure to stir in between bursts. Chocolate seizes if it is heated to much. Remove the cake balls from the fridge. Take a lollipop stick, dip 1cm of the stick into the white chocolate, and carefully skewer it into a cake ball. Poke the lollipop stick only halfway through, and NOT all the way. Refrigerate for 15 minutes. Pour the melted chocolate into a tall and narrow glass. Remove the cake pops from the fridge. Dip and coat the cake pops completely. Let the access drip off before sticking the cake pops into a styrofoam block for 10 minutes to set. Tip: If you are working in a very warm environment, stick the cake pops into the fridge for 5 mins to set. Once all your cake pops have been completely coated in white chocolate, add food colouring slowly into the white chocolate and dye the remaining chocolate red. Take your completely set cake pops (lightly touch to check if chocolate has hardened) and carefully dip the top half the cake pop into the red chocolate. Make sure you hold it completely vertically when dipping. Let access drip off and carefully stick cake pop into the styrofoam block for 10 mins to set. In a small bowl, dye buttercream icing black, and place in a piping bag. Fix a small writing tip, about 1mm in diameter, into the piping bag. Carefully pipe the black icing right onto the border of where the white and red chocolate meets on the cake pop. Once you complete the entire diameter, choose a spot on the border to pipe a black circle, just under 1cm in diameter. Take a mini marshmallow, and using a scissors, snip the height into half so that the circular side is maintained. Take the marshmallow and stick it onto the black circle on the cake pops. Your pokeball is now complete! *Cream cheese frosting: You may also use any leftover frosting. For cream cheese frosting recipe, click here. **You can buy buttercream icing or make it from scratch. For the recipe, click here.